Oceania Cruises’ new Riviera, launching in May, has a number of noteworthy design features, including a two-story Lalique staircase and a custom-crafted Italian chandelier accented by 380 crystal spheres. Designed by Lalique, the fabled French glassware firm, the double-curved staircases feature a balcony with balustrades of crystal medallions and scrolled iron. Six crystal pillars enhance the two-story, glass elevator surround. An Italian-made, 1,300-pound chandelier measuring 80 inches in diameter casts a glow that reflects off the staircase. 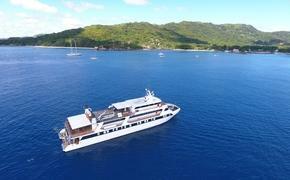 Overall, the ship was designed with a “country club casual atmosphere” and to feel like a private yacht. The 625 suites and staterooms have a contemporary look. Veranda and Concierge staterooms measure 282 square feet with a defined sitting area and balcony furnished with a chaise lounge, armchair and table. The 124 Penthouse suites measure 420 square feet with a living/dining room, separate sleeping area, walk-in closet and bathrooms with a double vanity. Oceania Cruises partnered with American designer Dakota Jackson, who fashioned more than 40 pieces of furniture and lighting to lend the Vista and Oceania suites the feel of a chic city apartment. They feature surfaces combining glass, stone, wood and metals together with rich, weighty fabrics such as mohair and silk chenille. Three Owner’s Suites measure more than 2,000 square feet, spanning the beam of the ship, and feature furnishings from the Ralph Lauren Home collection. Though Riviera mirrors sister ship Marina in many ways, it has several distinctive details including a new thalassotherapy pool on the deck at the Canyon Ranch Spa Club and larger changing areas, higher ceilings in the Polo Grill and Toscana restaurants, and a glass partition to the tub and a hand-held showerhead. Following a christening ceremony and event in Barcelona, the ship’s inaugural schedule begins with a 10-day maiden voyage May 16 from Venice to Athens. From May 16 through Nov. 29, Riviera will offer 20 departures of 12 itineraries, calling on ports in France, Italy, Greece, Spain, Portugal, Turkey, Israel, Croatia, Cyprus, Montenegro, Morocco and Monaco. Maiden calls are planned at Cephalonia (Argostoli), Motril (Granada) and La Palma in the Canary Islands.